From his investigation for Channel 4 Television in the newly released film, Vultures and Vote Rustlers. There was CIA involvement through a company called Mega Oil. They were shipping in arms under the cover of oil tools. 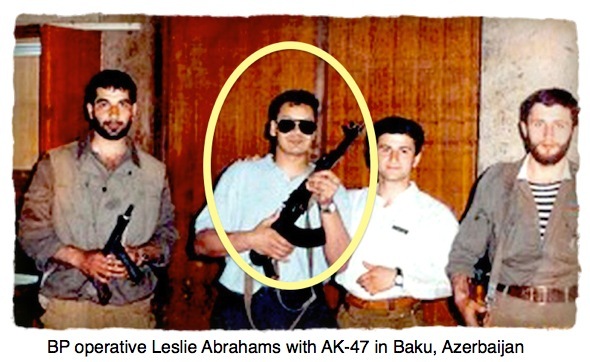 The BP executive was explaining to me how the CIA, MI6 and British Petroleum engineered a coup d’Ã©tat, overthrowing an elected president of a nation who was “not favorable to BP.” The corporation’s former Vice-President, Leslie Abrahams, is pictured here, holding an AK-47 in front of BP headquarters in Baku, Azerbaijan. Like most of the other BP executives I spoke with, he proudly added that while he was working for BP, he was also an operative for MI6, British intelligence. The conversation was far from the weirdest I had in my four-continent investigation of the real story of the Deepwater Horizon. The BP oilrig blew out on April 20, 2010, four years ago this Sunday. Earlier this month, the Obama Administration officially OK’d BP’s right to resume drilling in the Gulf of Mexico. And two weeks ago, just to assure the company that all is forgiven, the U.S. Department of the Interior gave BP a new contract to drill in the Gulf of Mexico”“right next to where the Deepwater Horizon went down. At the same time, the forgive-and-forget U.S. Justice Department has put the trial of David Rainey, the only BP big-shot charged with a felony crime in the disaster, on indefinite hold. The Deepwater Horizon blow-out incinerated eleven men on the rig and poisoned 600 miles of Gulf coastline. What political fairy dust does BP keep in its pocket to receive virtual immunity from the consequences? To understand what really happened in the Gulf of Mexico, and how BP became a corporate creature beyond the reach of the law, British television network Channel 4 sent me on a four-continent investigation through a labyrinthine funhouse of bribery, lap-dancing, beatings, Wikileaks, a coup d’Ã©tat, arrests and oil-state terror. I found the cause of the tragedy of the Deepwater Horizon seven thousand miles from the Gulf in the ancient city of Baku, the Central Asian caravan stop on the Silk Road. For the interview with agent Abrahams and the full story of the Deepwater Horizon, see, Vultures and Vote Rustlers, the documentary which will be available as a download without charge for the next two days courtesy of the not-for-profit Palast Investigative Fund. The literal source of Soviet power until 1991, Baku has been exporting petroleum for 3,000 years. As the Soviet Union shattered into pieces that year, BP set its sights on the city. It is now the capital of the new nation of Azerbaijan, which sits atop the biggest untapped oil field in the world, right beneath the Caspian Sea. Greg Palast is the author of Vultures’ Picnic, inside his investigations from the Arctic to the Congo, hunting down rogue billionaires. Palast’s reports are seen on BBC-TV and Britain’s Channel 4.